A supernatural courtroom drama, The Devil's Advocate takes a fiendish look at the world of high-stakes corporate law to find a literal hell on earth filled with souls for sale. In Gainesville, Florida, Kevin Lomax (Keanu Reeves) is a handsome and cocky hot shot defence lawyer. Raised by his deeply religious single mother Alice (Judith Ivey) and married to the vivacious Mary Ann (Charlize Theron), Kevin has never lost a case. Facing his worst crisis as he defends a pervert school teacher against charges of sexual molestation, Kevin pauses in the men's room to gather his thoughts before proceeding to shred the testimony of the young victim. He secures a stunning not-guilty verdict. Soon after, Kevin is recruited by a New York City law firm headed by John Milton (Al Pacino), and is quickly sucked into the lavish corporate culture alongside Milton's fellow executives Eddie Barzoon (Jeffrey Jones) and Christabella Andreoli (Connie Nielsen). But despite being handed the keys to a highly coveted apartment overlooking Central Park, Kevin's marriage to Mary Ann starts to suffer as she struggles to adapt to their new life. With Kevin's career soaring under Milton's mentorship, he is provided with the opportunity of a lifetime to defend real estate tycoon Alexander Cullen (Craig T. Nelson), accused of a triple murder. With his wife and marriage falling apart, the young lawyer begins to understand the price to be paid in return for tainted courtroom success. Directed by Taylor Hackford and based on the Andrew Neiderman book, The Devil's Advocate is glossy fun. The mix of adult themes wrapped into a devil's agenda narrative and plonked into the world of criminal law could have been a righteous mess, but Hackford maintains good control, helped by a polished screenplay co-written by Jonathan Lemkin and Tony Gilroy. 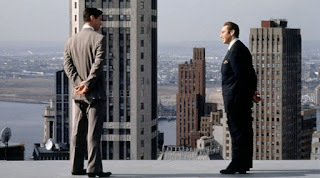 The Devil's Advocate carries many parallels with the equally good legal thriller The Firm, and inflates the cost of morally vague legal quests to its ultimate conclusion. Hackford brings in Alice's religious extremism as the counterweight to devilish desires, and includes liberal doses of crime, sexuality and extremes of wealth to create the domain where evil thrives. The film quickly gets down to the business of justice versus ethics, and the moral dilemma of proving innocence in a legal system that requires lawyers to stand by their clients no matter how putrid. It's a small step from there towards discarding principles of right and wrong and simply chasing the winning outcome at all costs, an apt description of selling the soul to maintain ever higher charge-out rates. If the devil and his acolytes were to choose a profession, defending the indefensible is a better choice than most. The Devil's Advocate hurtles towards Kevin coming to terms with his own destiny from the perspective of Milton's reality, with Christabella equally thrust into a central role as far as humanity's future is concerned. In a wild climax Hackford does lose some discipline, with the lure of the supernatural and Pacino's tendencies to veer towards excess overpowering the more cerebral aspects of the material. But to its credit, The Devil's Advocate does not shy away from the human responsibility to be accountable for each decision. As Milton insists to Kevin, there are choices at every step, and indeed Milton on several occasions offers up failure and withdrawal as viable options. It is up to Kevin to decide how far he will push himself into the moral morass; the devil just sets the stage for man's foibles to flourish. In a career littered with performances that resemble sleep-walking, Keanu Reeves is much more animated as Kevin Lomax, finally unshackling some passion and emotional depth. In her breakout role Charlize Theron is a revelation, the character of Mary Ann having the longest arc and traveling from joyous small-town wife to a big-city victim struggling with her husband's increasing work obsession and sinister colleagues. Equally campy and creepy, The Devil's Advocate makes a compelling case for demonic entertainment.